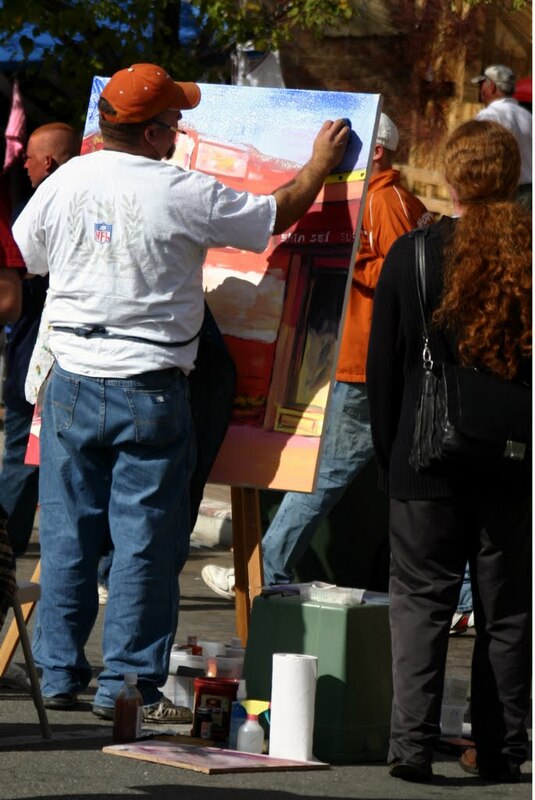 Stephen Henry, an art teacher at Two Rivers High School, participates in the Ogden Arts Festival plein air event. Summer approaches, and with long days, blue skies, and dry brush arrives the season for Utah’s plein air festivals. All told, over $20,000 in prize money is being offered at competitions from the top to the bottom of the state and many points in between. So, time to go back through some of the plein air Hints & Tips articles by John Hughes in past editions, get out those traveling easels, put a little gas in the car, and hope to trade a few hours worth of work for some cold hard cash. The process for most competitions if pretty similar. Artists register their surfaces with the sponsoring organizations and then have from a day to sometimes a week to paint within a geographically restricted area. Their entries are then submitted to a jury (the number allowed varies), money is awarded and all the work is presented to the public in an exhibition. The first opportunity to paint begins this weekend at the Ogden Arts Festival annual competition. Artists interested in the $6000 in prizes can begin painting this weekend. If they want a few tips before they go in the field alone, they can sign up for the Glen Hawkins workshop, June 1 and 2. Click here for more info. The actual festival takes place June 8th and 9th. Artists can try their hand the following week at Logan’s Summerfest, and at the end of the month in Midway. The batch of competitions resumes in the fall with events in Helper, Spring City, Moab, Escalante, and in November plein air art lovers can enjoy the invitational competition at Zions National Park.